TAMPA, Fla. - Sept. 14, 2018 - PRLog -- Down & Out Books is pleased to announce that DESPERATE TIMES CALL: STORIES by Hector Duarte, Jr. is published today by its imprint Shotgun Honey in trade paperback and ebook formats. Society is a tough place to live. Daily, it seems, a huge thumb presses down on us. What happens when someone pushes back, flips off the gigantic, karmic oppressor? Or simply caves in and decides to wallow in the gutter? 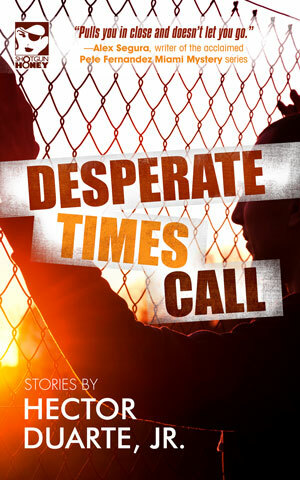 Desperate Times Call is a collection of stories about people on society's fringes and margins. Characters pushed to their limits, left without much choice but to give in, push back, or simply explode. A high school senior comes home to find her drug-addicted father dead. She always suspected the day would come but it's here. Now what? Tomas finally meets the girl he's been chatting with on a social networking app only to find she looks nothing as advertised. In fact, she has a huge scar across the left side of her face that comes with a story that will change both of them forever. A father lets his anger get the best of him and must confront the consequences of faulty, impulsive judgment the best way he can think of: surprising his twin girls during recess. He's packing sandwiches and a gun. How do we answer when Desperate Times Call? Hector Duarte Jr is a writer out of Miami, Florida. He is editor at The Flash Fiction Offensive and teaches English at the high school and college levels. He has lectured on crime fiction and led flash fiction workshops at several international conferences. His work has appeared in Shotgun Honey, HorrorSleazeTrash, Spelk Fiction, Just to Watch Them Die: Crime Fiction Inspired by the Songs of Johnny Cash, and many more. This is his first short story collection. In its eighth year as an independent publisher of award-winning literary and crime fiction, Down & Out Books (https://downandoutbooks.com) is based in Tampa, Florida. For more information about the book, to request a review copy of the book, or to inquire about an interview with the author, contact lance@downandoutbooks.com.